Winner of the American Book Award, this book represents, as Mayumi Tsutakawa puts it in the introduction, “a fine diversity of Asian American women who may claim their native soil in Oakland or Tucson or Manila or New Delhi. These writers and artists, many of them young or publishing for the first time, are breaking down a barrier to make a statement. Wherever they live, in an Asian ghetto or as the only Asian family in a suburban subdivision or Midwest college town, they are dealing with the majority culture daily. 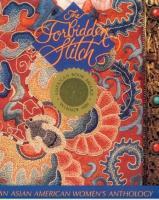 They are, in many cases, living with spouses or children who don’t know/don’t care about/for the Asian culture the woman may tenaciously cling to.” Co-editor Shirley Geok-lin Lim adds: “the voices found in The Forbidden Stitch are so plural as to cast doubt on the unity of the anthology.… If the stitch is multi-colored and complexly knotted, still it holds together a dazzling quilt.” This ground-breaking first Asian American women’s anthology breaks barriers of invisibility that Asian American women have faced. Among the more than 80 writers and artists are Mei-mei Berssenbrugge, Diana Chang, Marilyn Chin, Jessica Hagedorn, Mayuni Oda, Nellie Wong, Merle Woo, and Mitsuye Yamada.